​OUR MISSION— KIND WORDS. KIND ACTS. 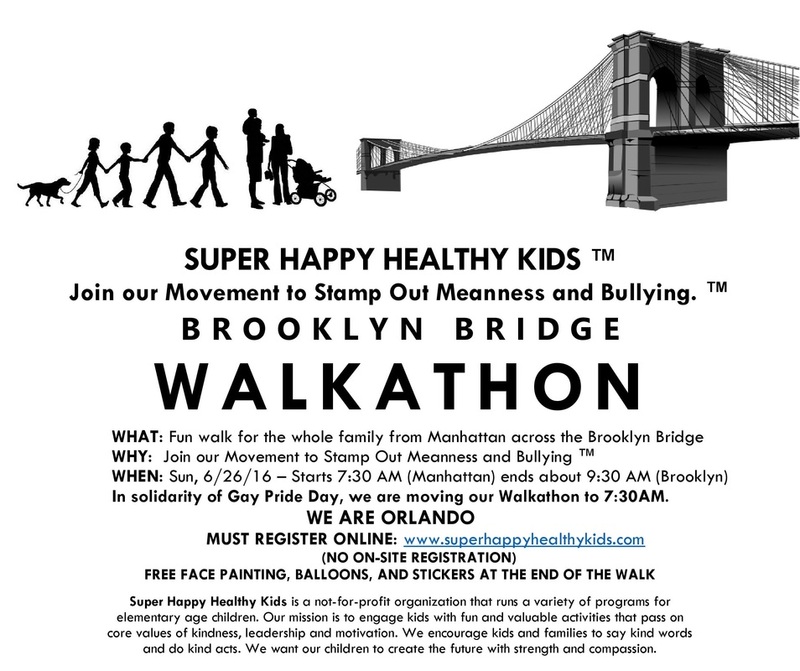 ​Led by its Founder and President, Roosevelt Island-based James Jay Dudley Luce Foundation joins Super Happy Healthy Kids in a Brooklyn Bridge walkathon to "stamp out meanness and bullying." "We will have a full crew out and support, from board members to global advisors to interns," says Jim Luce. The foundation he heads is a philanthropic supporter of Super Happy Healthy Kids, and the organization is taking its commitment a step – actually quite a few steps farther in walking with them across the Brooklyn Bridge on Sunday, June 26, beginning on the Manhattan side at 7:30 a.m. and wrapping up in Brooklyn with "free face painting, balloons and stickers." The early start is in solidarity with New York City's Gay Pride Parade. The walkathon will be finished before the city's biggest gay party of the year sets off on Fifth Avenue. Super Happy Healthy Kids year round emphasis on aiding children meshes perfectly with the Luce Foundation's mission "to support young global leadership impacting positive social change." "Our enrichment team's mission is to make sure each child feels special, gains leadership and social skills, all while maintaining inner peace," is the Super Happy Healthy Kids overview. A combination of after school programs and camps helps kids by "building character, integrity and responsibility." Along with the expected sports, camp activities include innovative practices in karate, meditation and yoga. Join the Jim Luce, J Luce Foundation and other Roosevelt Islanders in supporting Super Happy Healthy Kids's mission to stamp out meanness and bullying by encouraging positive, constructive interactions among children. It costs only $20 per person to participate in the walkathon and have a great time along the way.